Aidan Delgado is a former soldier in the 320th Military Police Company of the United States Army, best known for having become a conscientious objector in April 2003 during his deployment to Iraq and for disclosing information about Abu Ghraib. Delgado states that he joined the Army Reserve while he was also investigating Buddhism. He signed his enlistment contract on Sept. 11, 2001. He began a year-long tour in Iraq in April 2003, he was openly questioning whether he could participate in the war in Iraq good conscience, due to his newfound dedication to the principles of pacifism espoused in his faith. He filed for conscientious objector status and continued to serve in Iraq while it was processed. As the only member of his company who spoke Arabic, Delgado was in frequent contact with Iraqi civilians. The son of a diplomat, Delgado grew up in various countries, including Thailand, where he was introduced to Buddhism, and Egypt, where he learned Arabic. When his colleagues learned that he spoke some Arabic and enjoyed meeting Iraqis, they made use of him but also began to mistrust him. As Delgado witnessed more and more American racism, arrogance, and abuse of unarmed Iraqis, his opposition mounted. Concluding that war ran counter to his Buddhist principles, he sought conscientious objector status and, after finishing his tour of duty, was honorably discharged in April 2004. Delgado is actively involved in the anti-war movement. He has participated in numerous peace activities across the country, and led the 70-member "Florida For Peace" group to Washington, D.C., on September 24, 2005 to participate in the rally organized by United for Peace and Justice. He has also given many presentations on the abuses committed at the Abu Ghraib prison, at which Delgado was stationed for six months. Delgado sparked considerable controversy when, upon his release from the Army and his return to the United States, he asserted, in an interview with The New York Times columnist Bob Herbert, to have witnessed egregious cases of abuse perpetrated against Iraqi civilians by American soldiers. After the Bob Herbert interview, Delgado provided a sworn statement and copies of photographs taken at Abu Ghraib to Army CID and IG investigators. 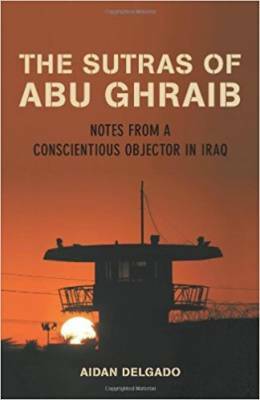 Aidan's new book 'The Sutras of Abu Ghraib' (Beacon Press 2007) details his transformation from Army Reserve volunteer to Buddhist conscientious objector and critic of the war in Iraq.